73: By Next Summer, It Must Be. We’ve been on this baby for a long time now, and of course are getting restless. The heat becomes more and more oppressive–shirts are always wet and soggy, and you actually steam when you go below decks. Wish we were doing this in winter, as we did last time. Hard, terribly hard to bring yourself to realize that summer is coming into her first full bloom back home, that you girls are wearing flouncy, starchy summer dresses, that the windows are wide open to welcome the warm night air, and the comforting hum and rumble of New York at night. How is this season’s show at the Lacy’s across the street? Do those two pretty ballet dancers still pirouette around their room in negligee? What plants do you have in the window this year, Mother? I was always partial to the grapefruit we had at 200. I hope it won’t be too long before I see it all again. By next summer, it must be. 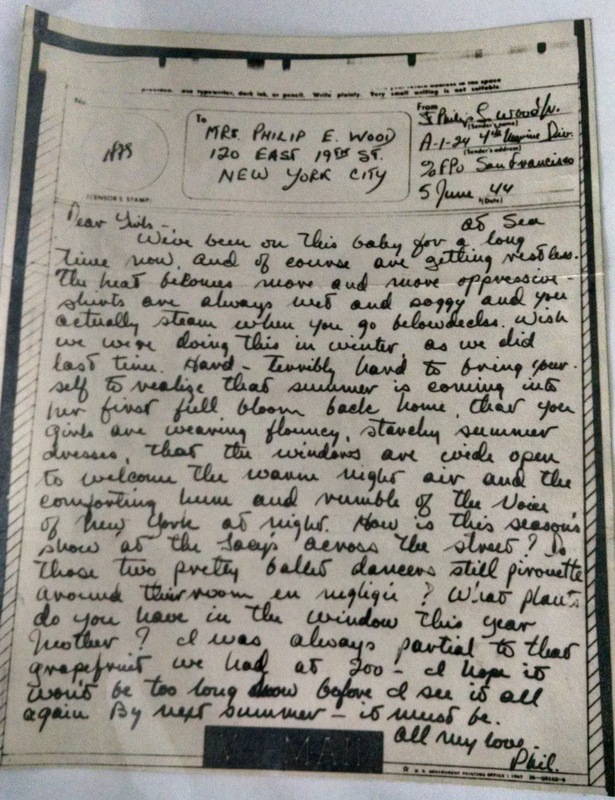 GWW edition gives date of June 15, or D-Day on Saipan, leading to an earlier assumption that this was Phil’s last letter home. Aboard USS Calvert, en route to Saipan.